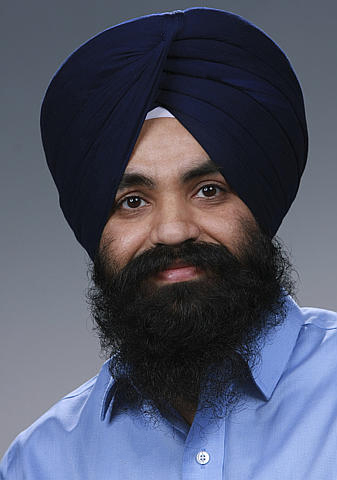 Congratulations to Pacific Northwest National Laboratory's Dr. Balwinder Singh who was honored with an Outstanding Contribution Award from the U.S. Department of Energy's (DOE's) Accelerated Climate Modeling for Energy (ACME) project during the group's bi-annual science team meeting. Singh was singled out by the Software Engineering/Coupling co-leads for his "critical role and sustained effort as an integrator for the Atmosphere Group during a difficult time culminating in the first version (v1) of the ACME model." Demonstrating the award's criteria for commitment, important scientific or technical advances, or noteworthy inter/intra-disciplinary teamwork, Singh was praised for his positive and generous contributions, stepping in for the team during crunch times. He is one of three top contributors to the team's "github repository," a virtual storage for parts of the model coding the team works on and shares issues and solutions for the final product. Singh plays an essential role in maintaining broad code coverage for atmospheric tests, which is critical to the ACME software engineering strategy. Singh earned his PhD in mechanical engineering from the University of Utah. He joined PNNL in 2010 and has worked on challenges in high performance computing and atmospheric modeling in the Atmospheric Sciences & Global Change Division, most recently on the ACME project.